This type of machining tool has both the capability of cutting and ripping various types of lumber. That notwithstanding, the radial arm saw is even more versatile as it has other vast applications in overhead routing, drum sanding and surface planing. This type of saw requires professionalism in handling tasks because it is potentially dangerous. This is because it is dangerous when the angled crosscuts are made without caring where the user’s hand is placed. Spin direction of the saw may pose a risk where the user decides to collect materials without looking on the spinning direction, which is unadvisable. In the tools’ shops where there could be a radial arm saw for sale, the purchaser is expected to make his decision based on the particular uses that he intends to use the saw. Various aspects of the saw in the purchasers mind will drive him to buy a saw that he cannot regret buying it. The durability and versatility of the saw will be compelling the buyer to buy the saw. 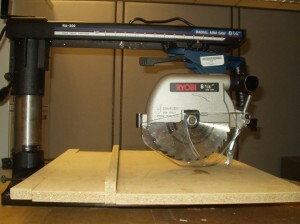 Since the miter saw technology is phasing out the radial arm saw, the purchaser must make an informed decision and buy a saw with more accuracy and undisputed precision. An experienced professional can use the radial arm saw to serve most wood work needs. There are also radial arm saws designed to cut metal. If the purchaser were not a professional, hiring one to do the wood work for him would be a worthwhile consideration. This will prevent the purchaser from making the wood work worse than when the professional uses it. It will ensure that the purchaser has extra time to work on the other part of his wood work. Timely finishing of his job will be an added advantage although at a cost. If the purchaser ignores the professionalism, he may injure himself thus incurring more costs. The various cuts made using the radial arm include the cross-cut; which could be limited by the length of the arm, and complex miter cut. The radial arm saw can make better cuts than it can do ripping. This means that a buyer must consider investing in few additional tools. Special design for these tools will be crucial for carrying out of specific tasks, which result to increased efficiency. The process of ripping through thick stock of wood may make the radial arm saw to overheat. Overheating causes the motor to jam. Controlling heating is essential for better saw performance. Although the radial arm saw has considerably high performance, its accuracy will still be wanting. This is contributed for instance by the design of its arm. The wandering of the blade and considerable deviations of the arm coupled with the wear and tear over time will pose the accuracy problem. In case of breakdown, the components of the saw would require high-tech skills to assemble. This implies that if accuracy can be guaranteed, the user must handle all tools well. This will probably involve using the tool for its purpose as well as maintaining it for use in the future.